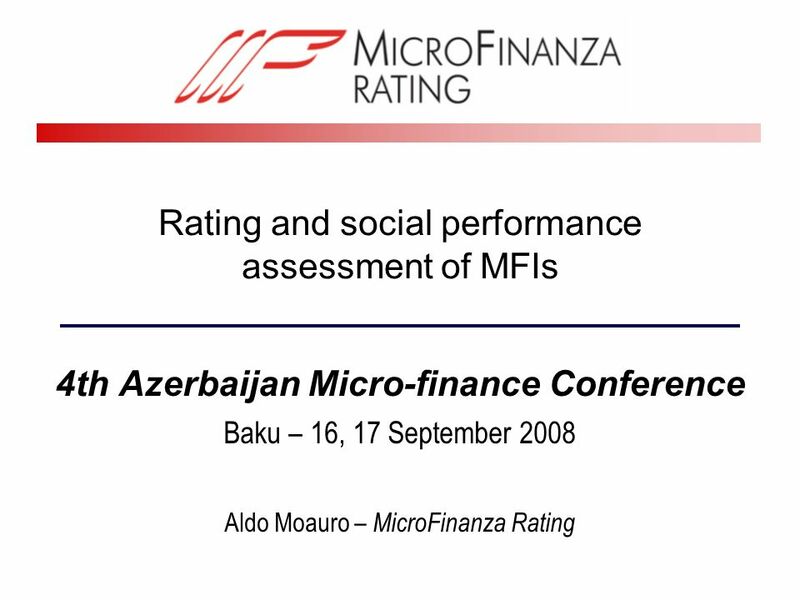 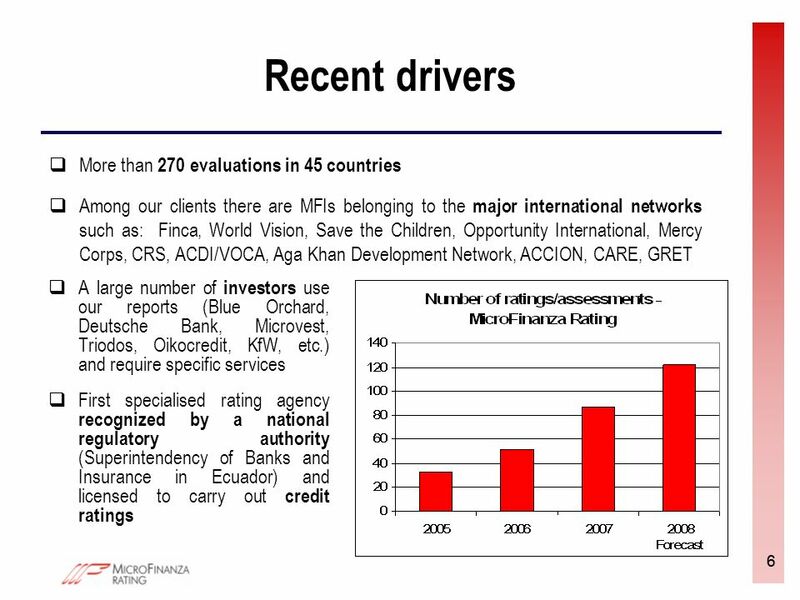 Rating and social performance assessment of MFIs 4th Azerbaijan Micro-finance Conference Baku – 16, 17 September 2008 Aldo Moauro – MicroFinanza Rating. 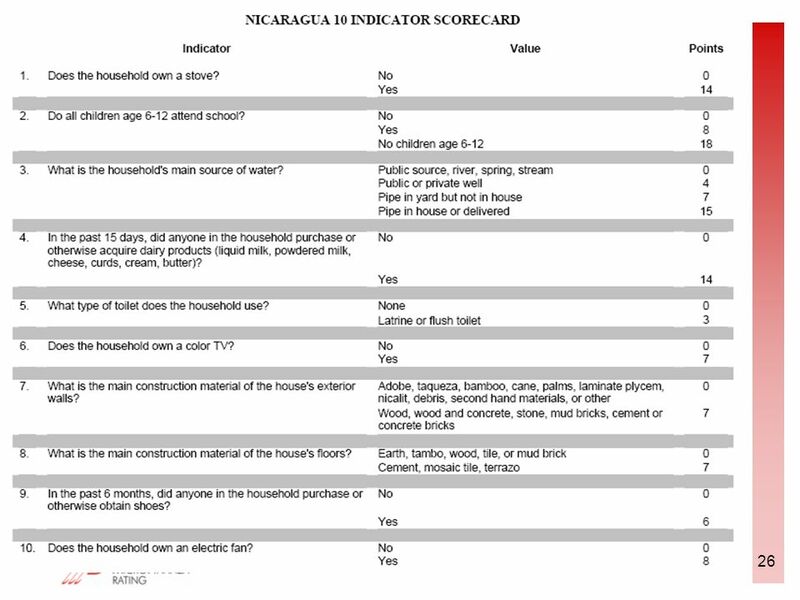 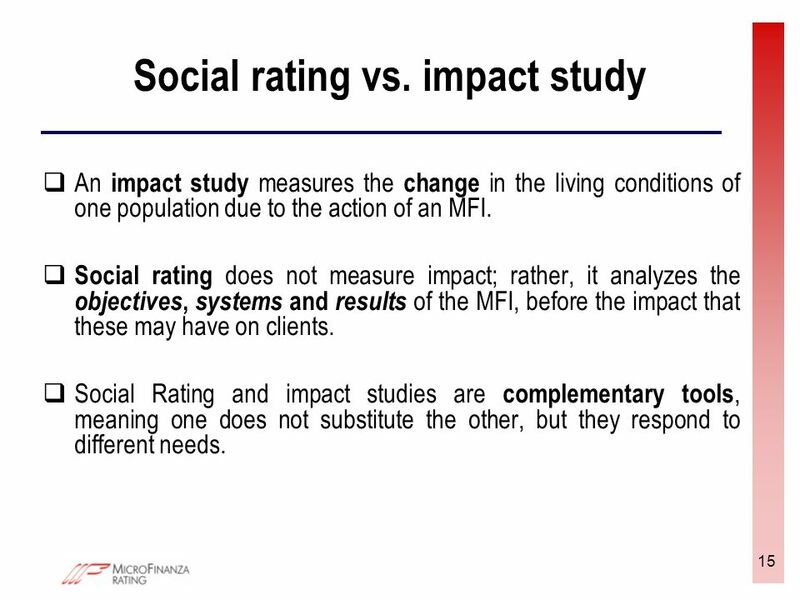 15 15 Social rating vs. impact study An impact study measures the change in the living conditions of one population due to the action of an MFI. 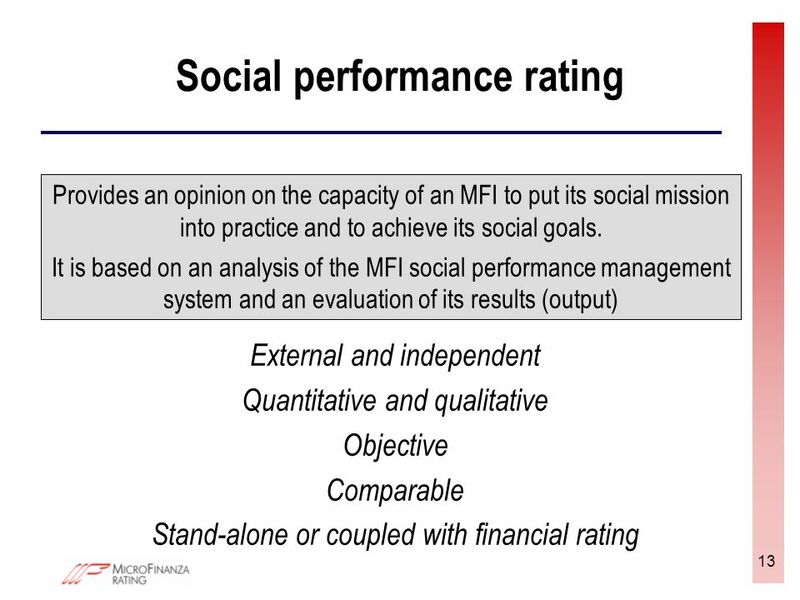 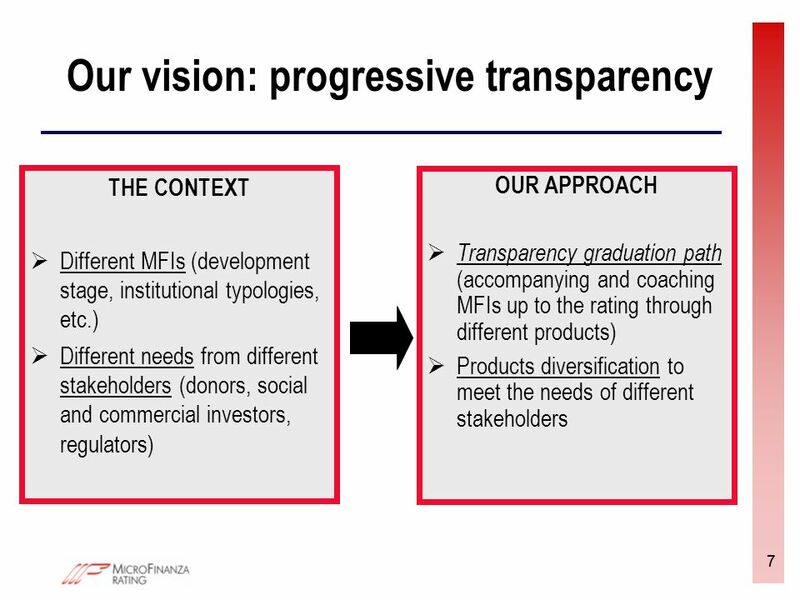 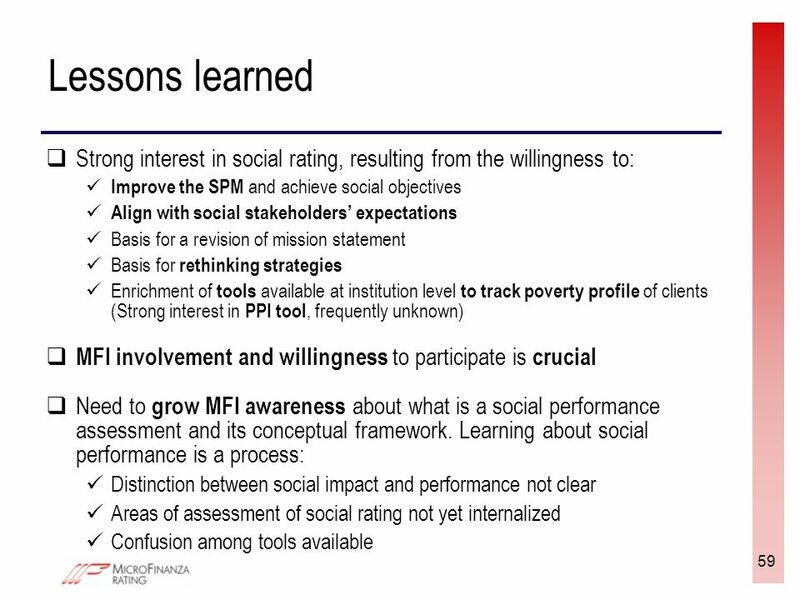 Social rating does not measure impact; rather, it analyzes the objectives, systems and results of the MFI, before the impact that these may have on clients. 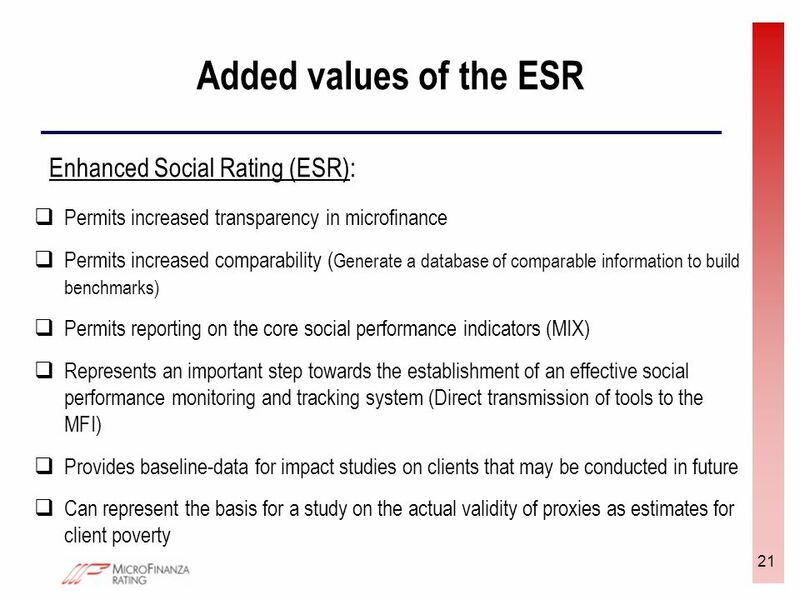 Social Rating and impact studies are complementary tools, meaning one does not substitute the other, but they respond to different needs. 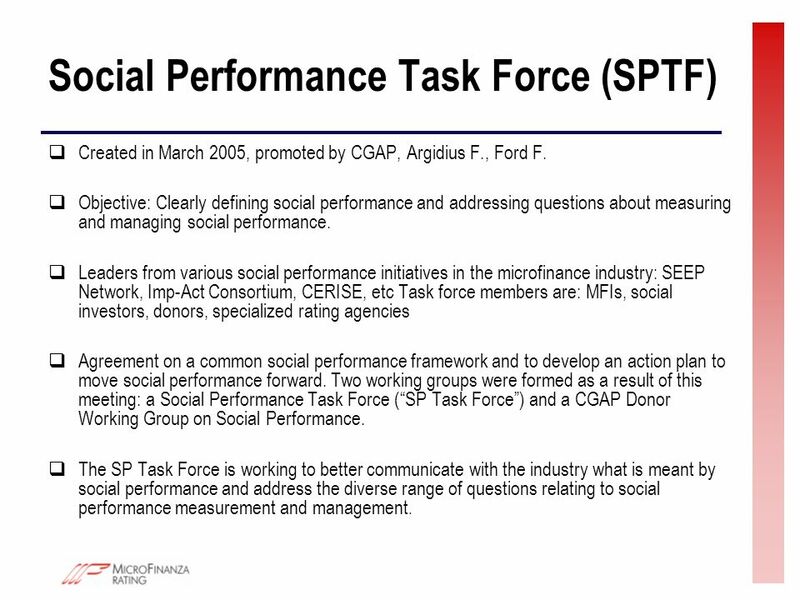 16 Social Performance Task Force (SPTF) Created in March 2005, promoted by CGAP, Argidius F., Ford F. Objective: Clearly defining social performance and addressing questions about measuring and managing social performance. 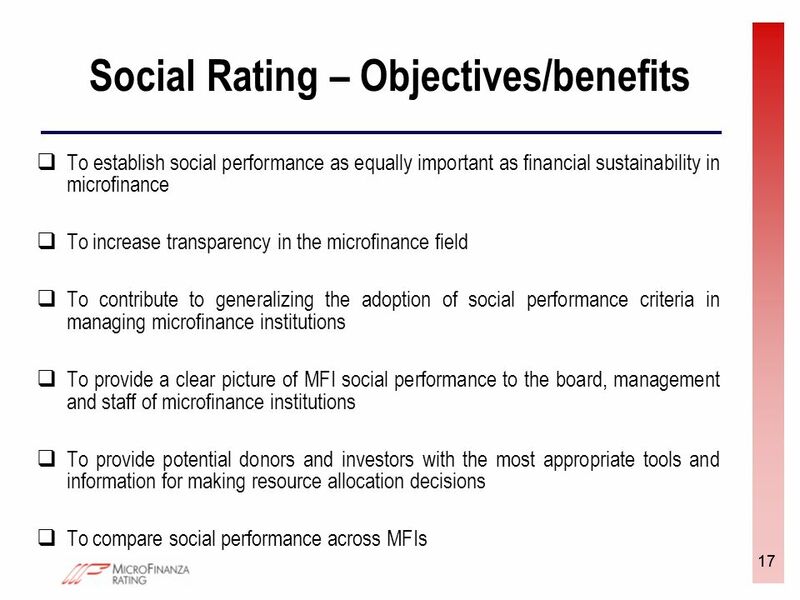 Leaders from various social performance initiatives in the microfinance industry: SEEP Network, Imp-Act Consortium, CERISE, etc Task force members are: MFIs, social investors, donors, specialized rating agencies Agreement on a common social performance framework and to develop an action plan to move social performance forward. 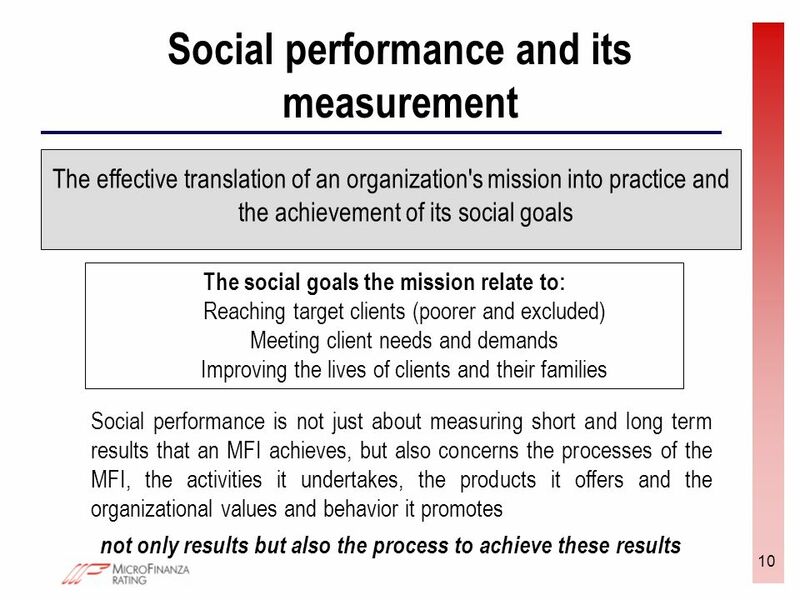 Two working groups were formed as a result of this meeting: a Social Performance Task Force (SP Task Force) and a CGAP Donor Working Group on Social Performance. 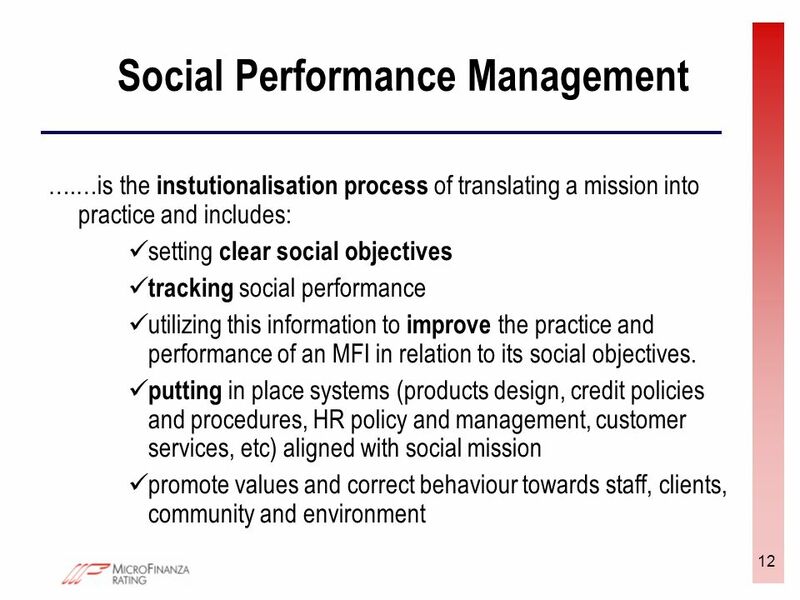 The SP Task Force is working to better communicate with the industry what is meant by social performance and address the diverse range of questions relating to social performance measurement and management. 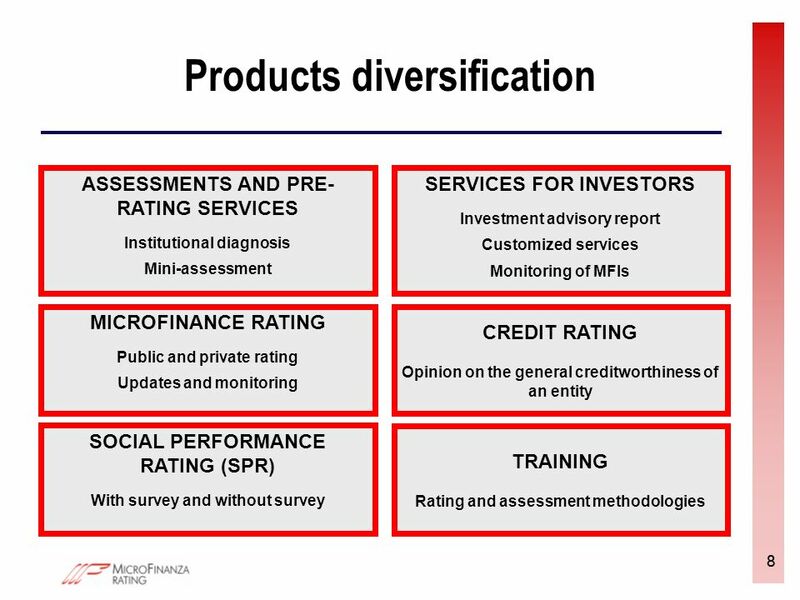 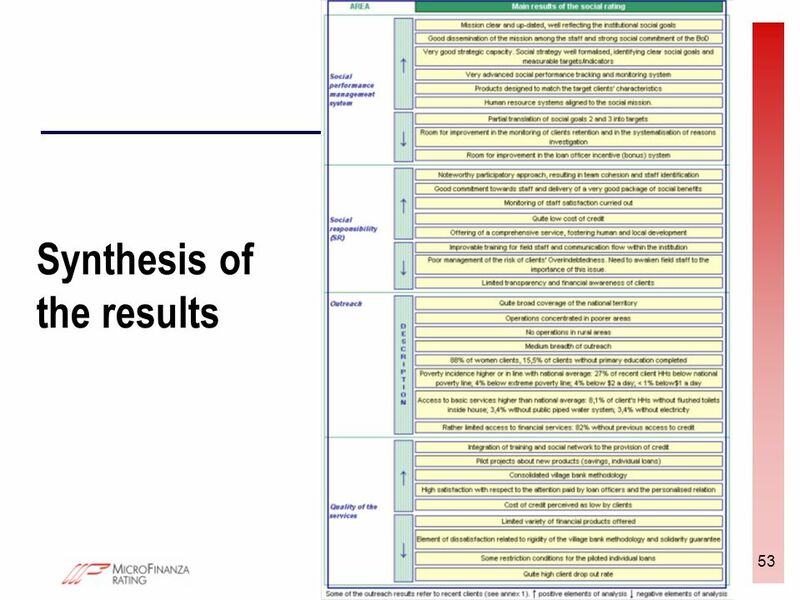 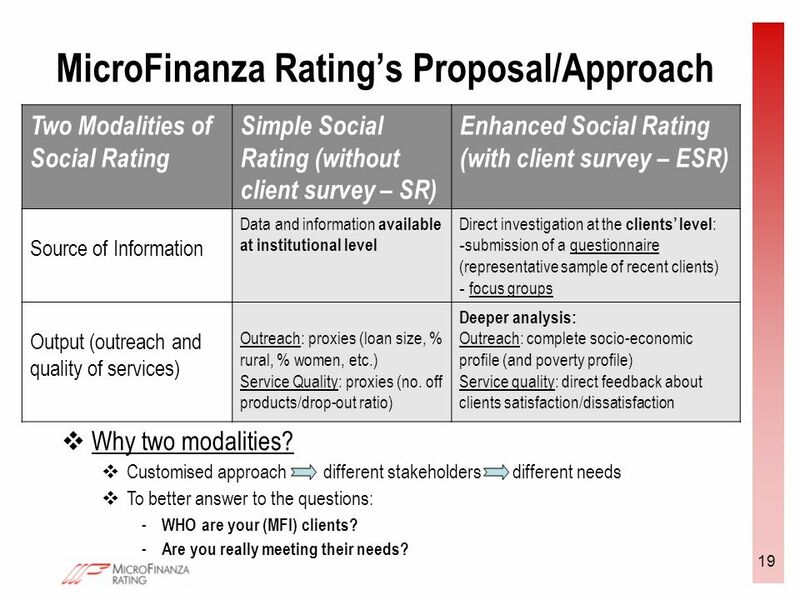 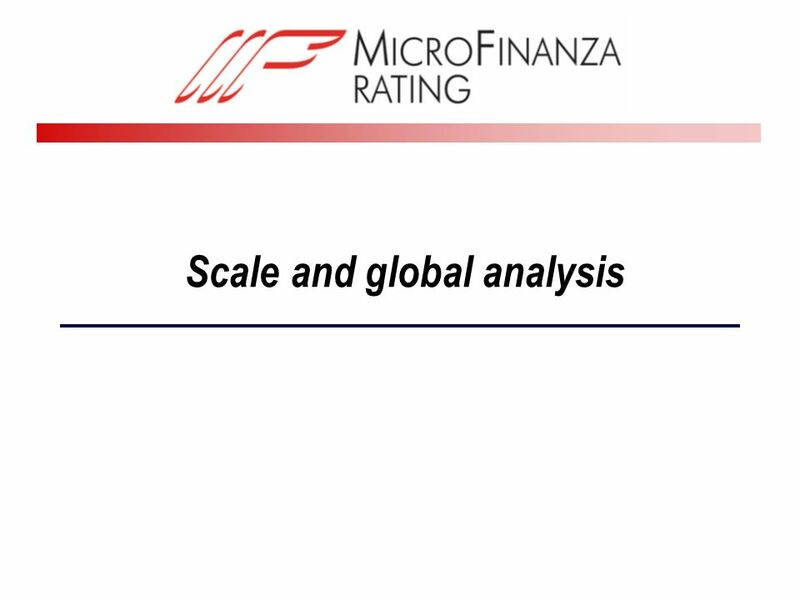 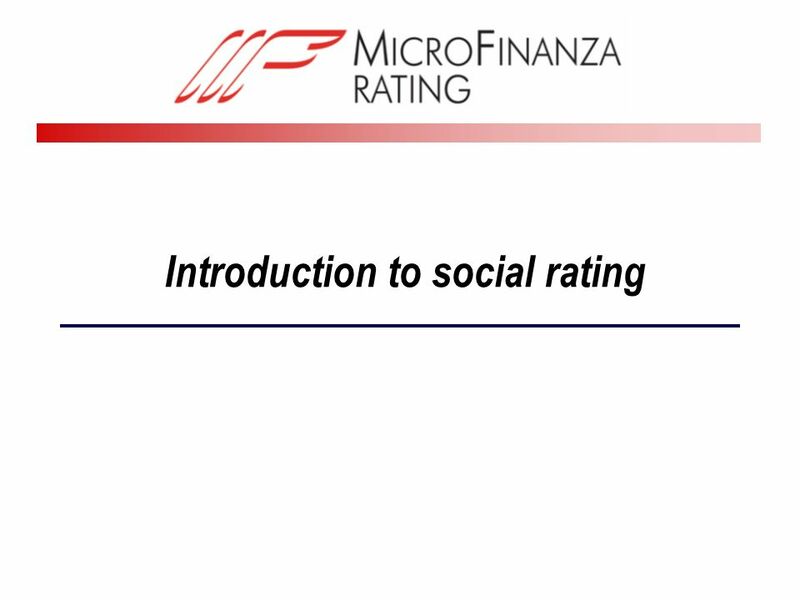 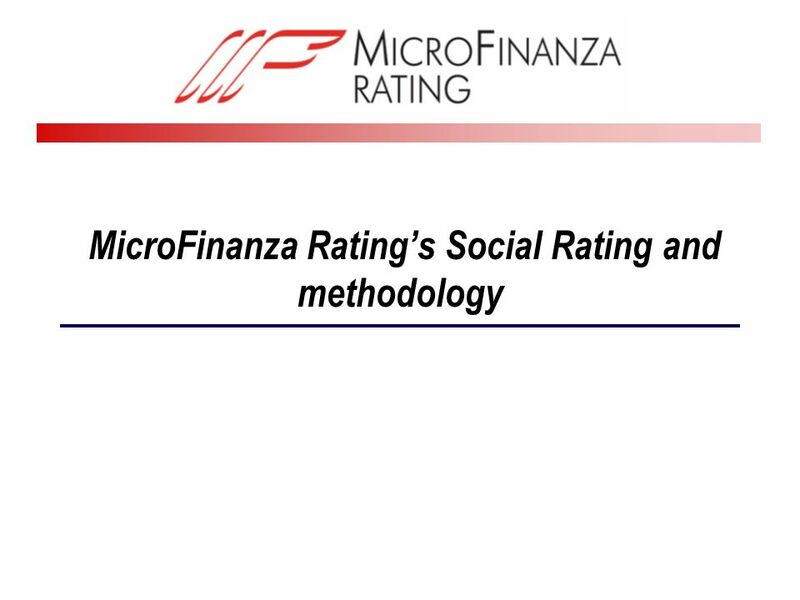 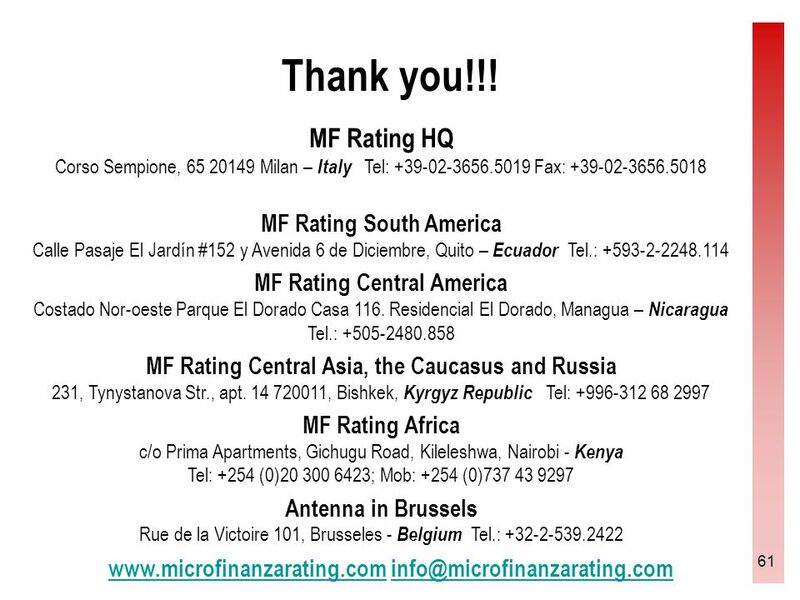 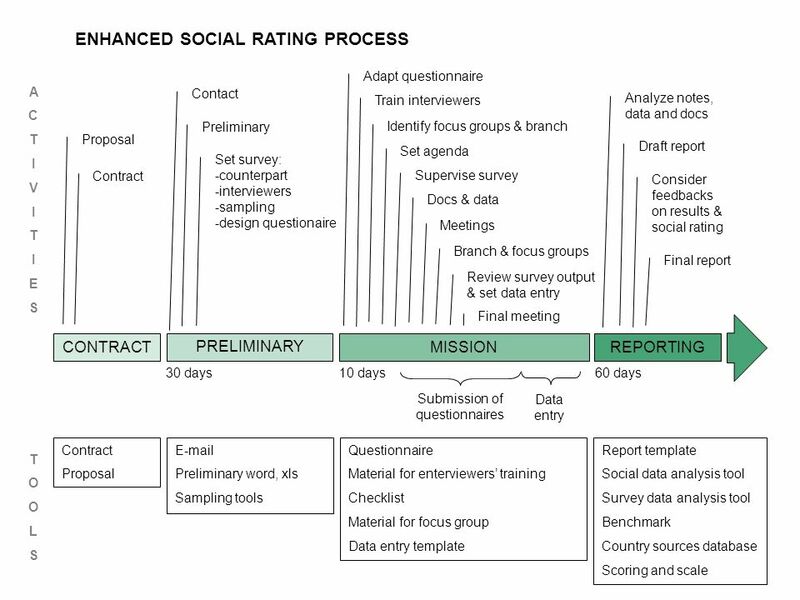 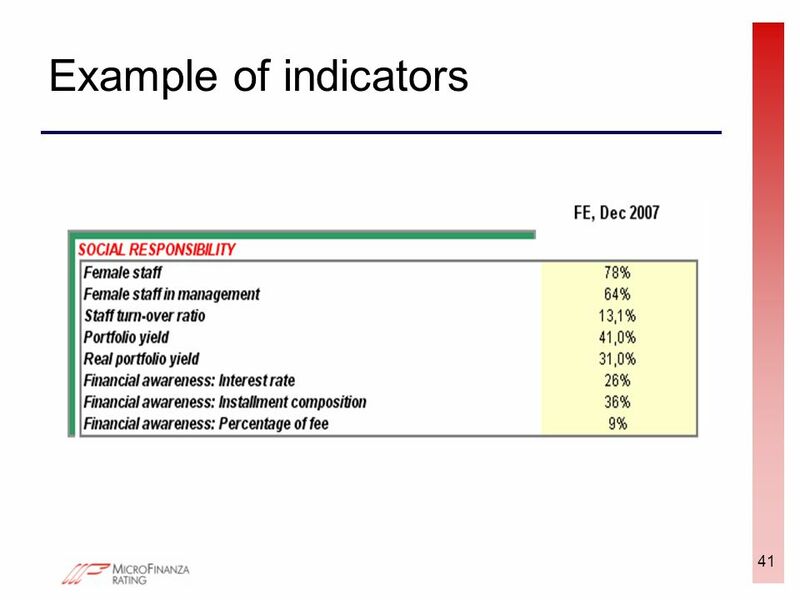 19 19 MicroFinanza Ratings Proposal/Approach Two Modalities of Social Rating Simple Social Rating (without client survey – SR) Enhanced Social Rating (with client survey – ESR) Source of Information Data and information available at institutional level Direct investigation at the clients level : - submission of a questionnaire (representative sample of recent clients) - focus groups Output (outreach and quality of services) Outreach: proxies (loan size, % rural, % women, etc.) 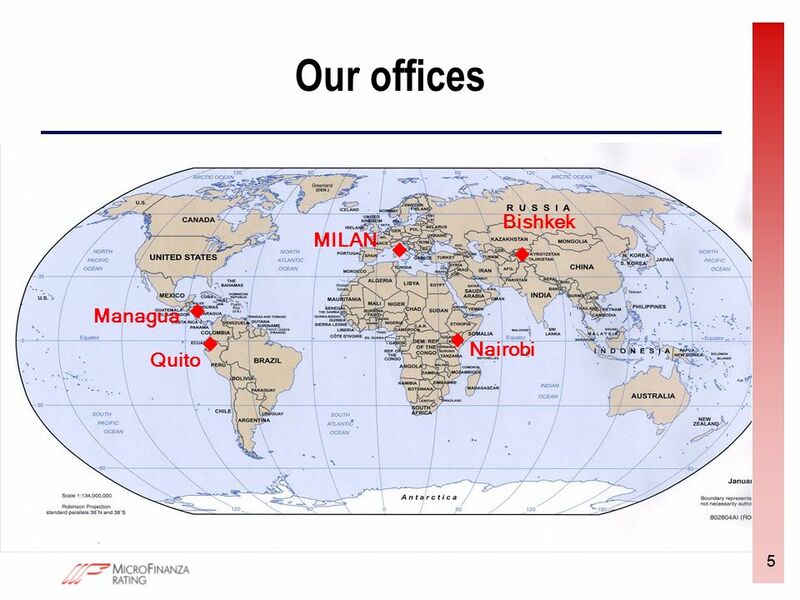 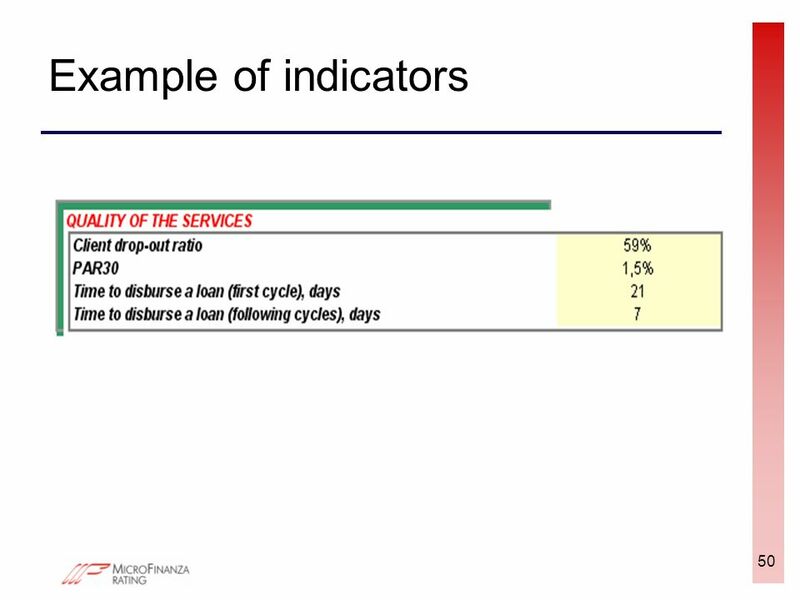 Service Quality: proxies (no. 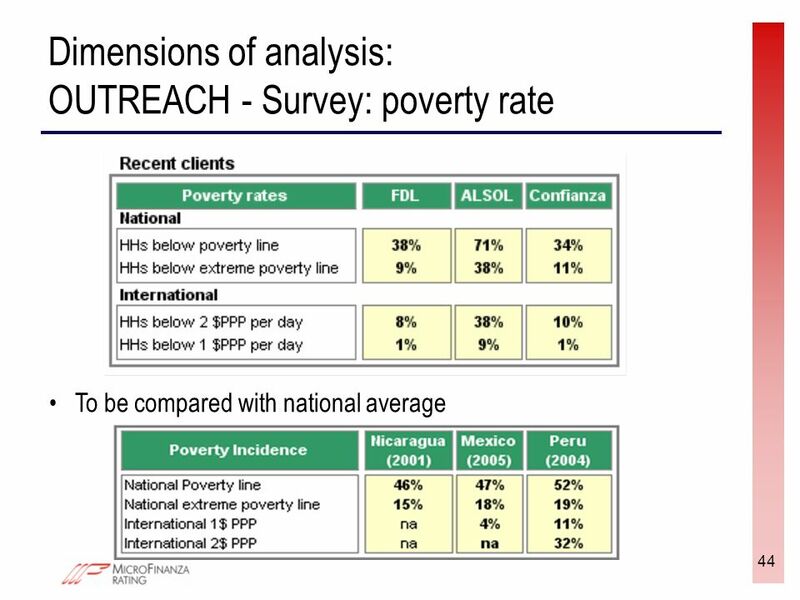 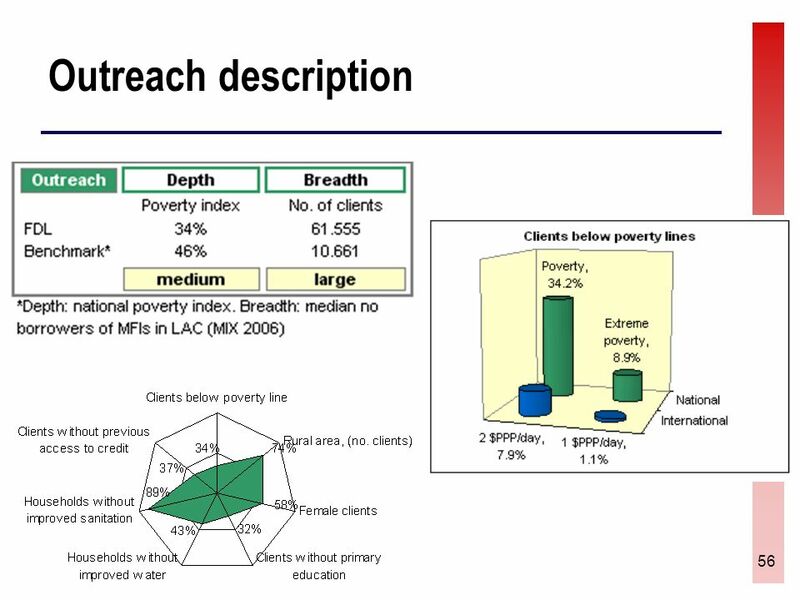 off products/drop-out ratio) Deeper analysis: Outreach: complete socio-economic profile (and poverty profile) Service quality: direct feedback about clients satisfaction/dissatisfaction Why two modalities? 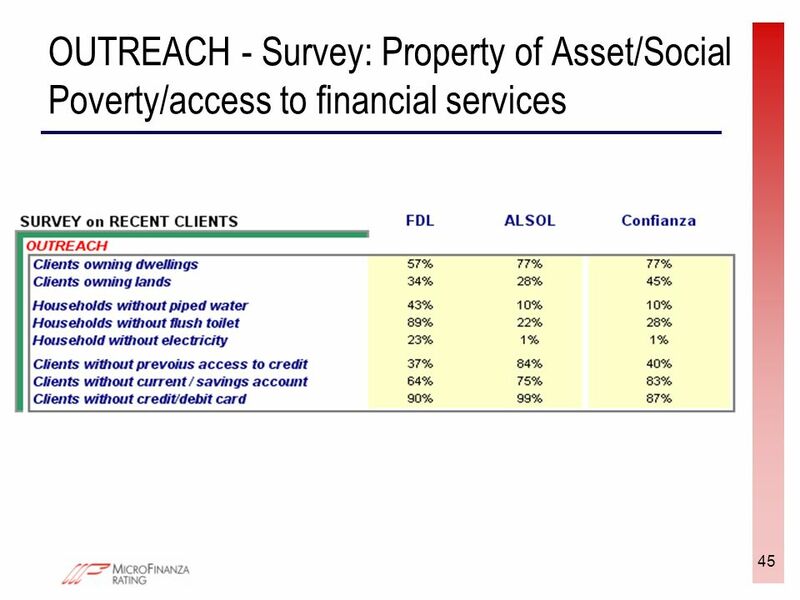 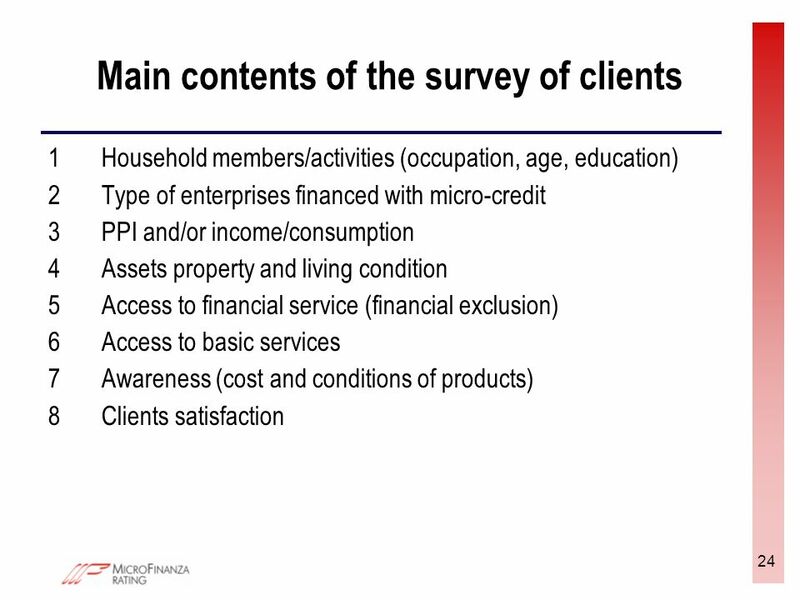 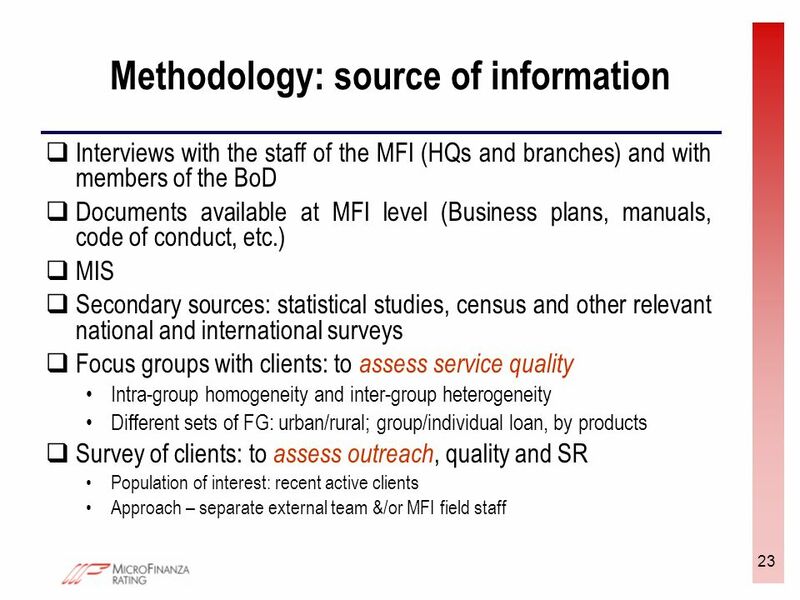 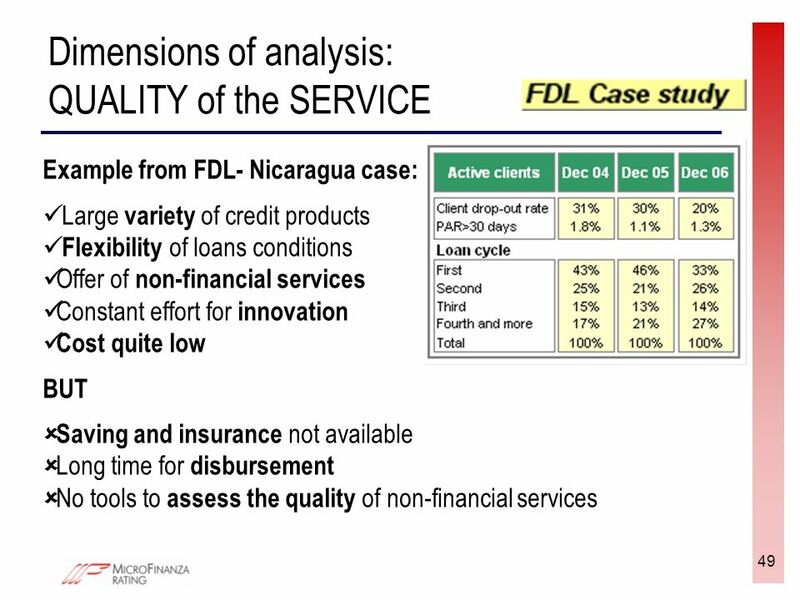 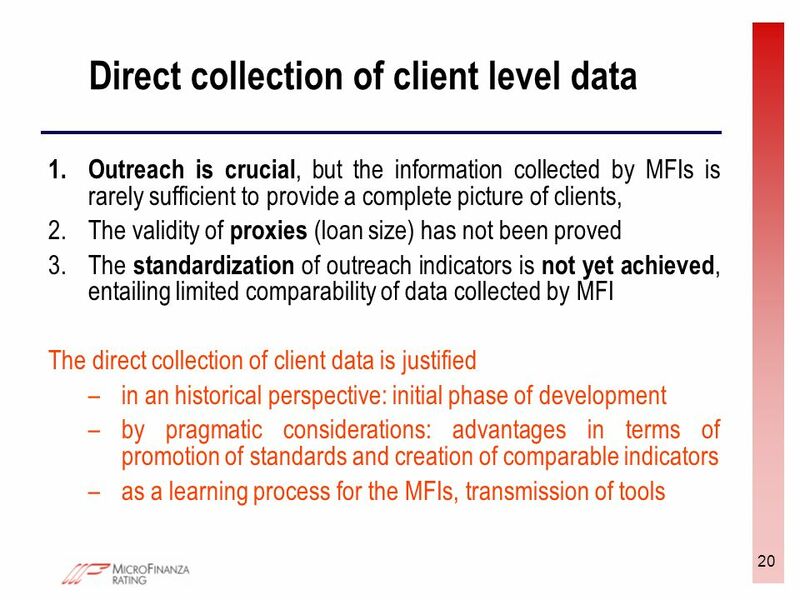 Customised approach different stakeholders different needs To better answer to the questions: - WHO are your (MFI) clients? 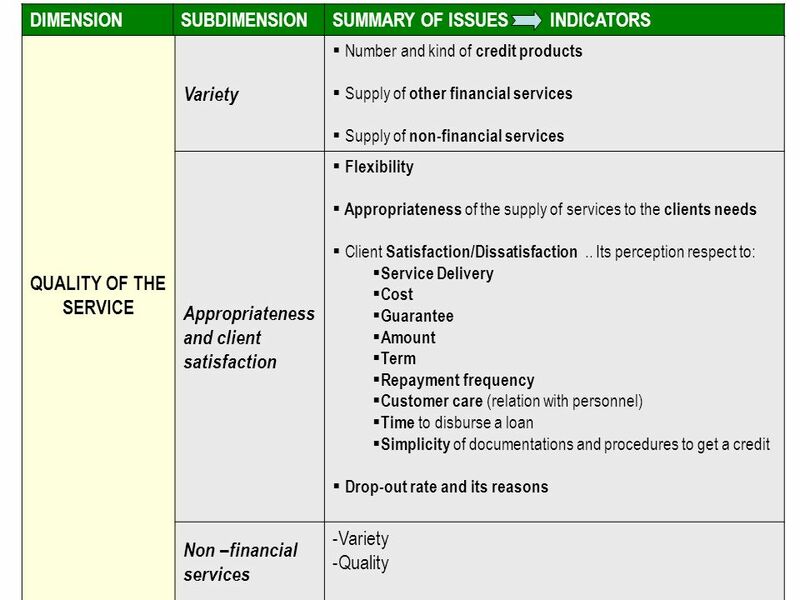 - Are you really meeting their needs? 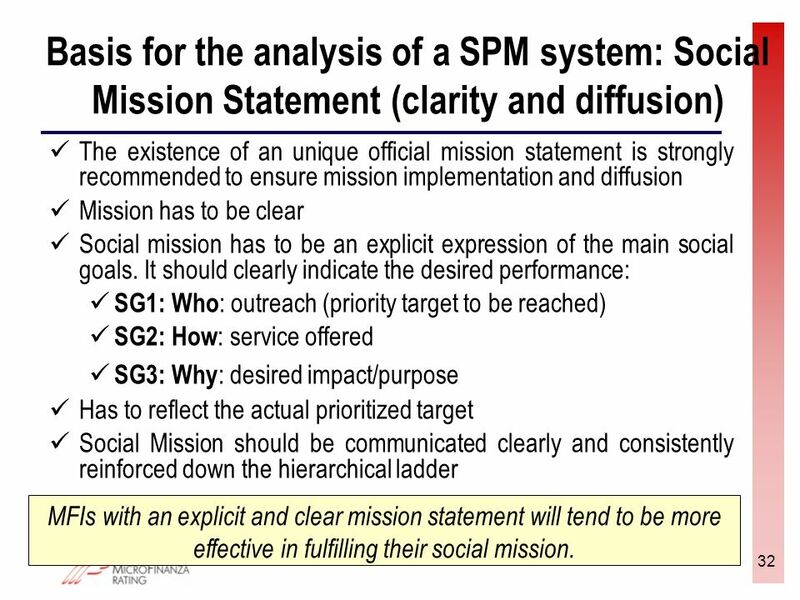 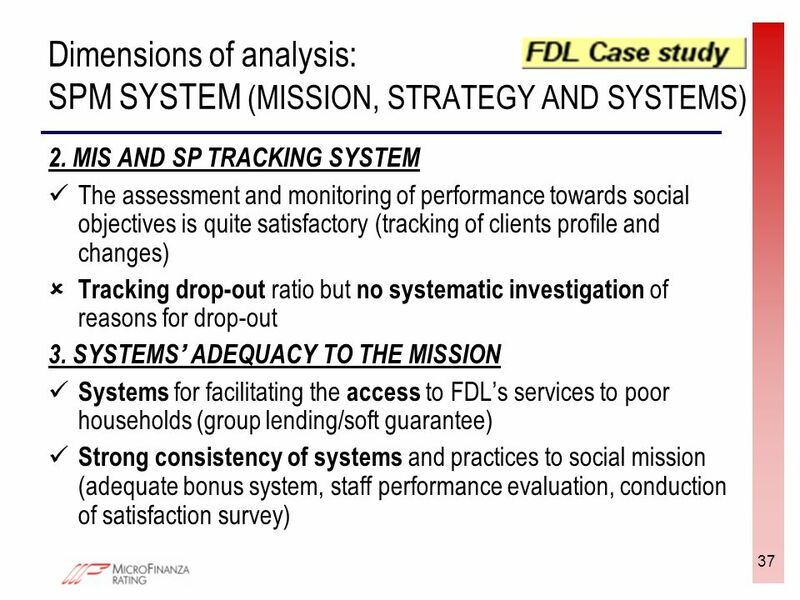 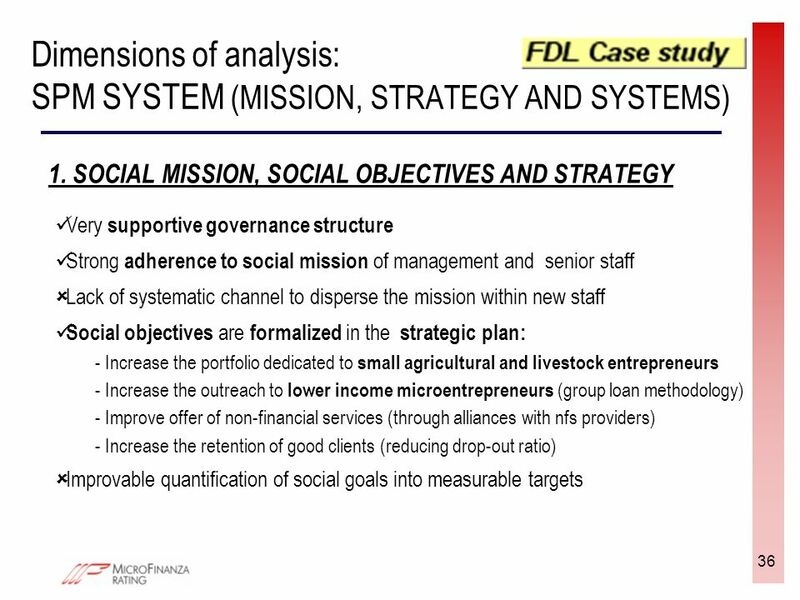 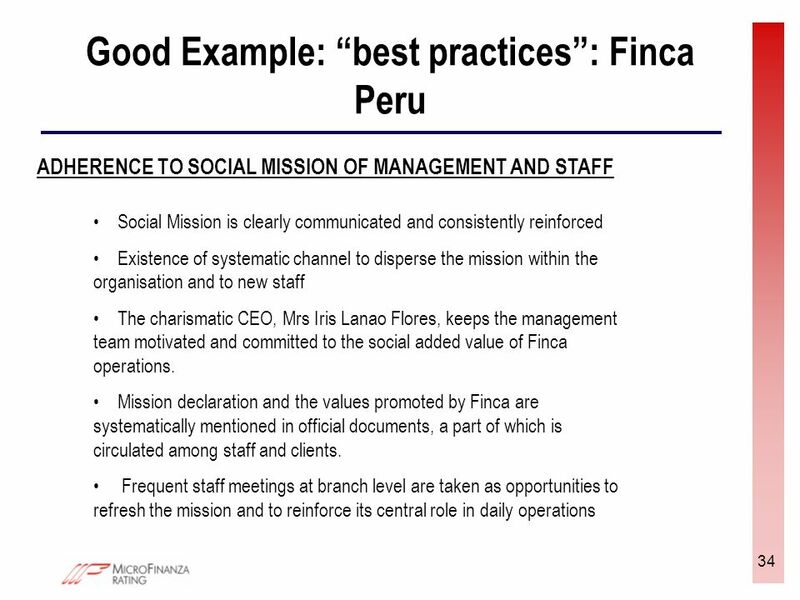 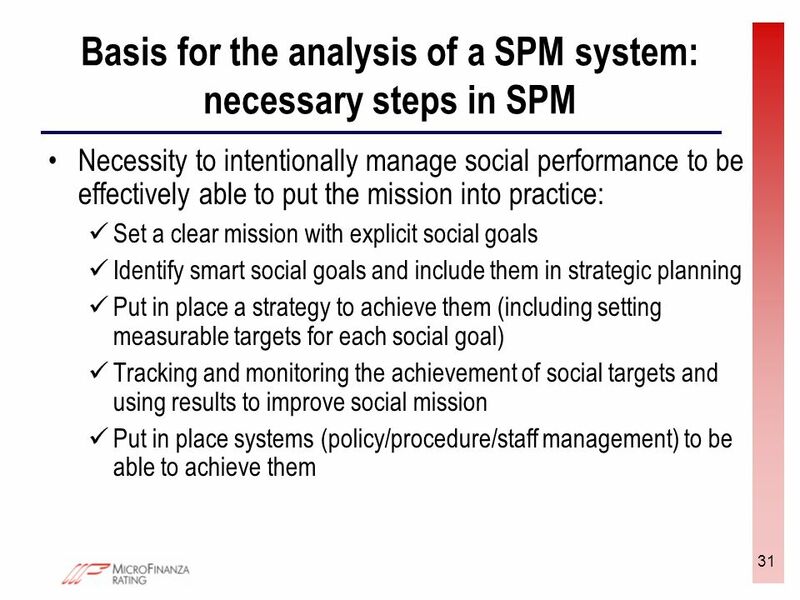 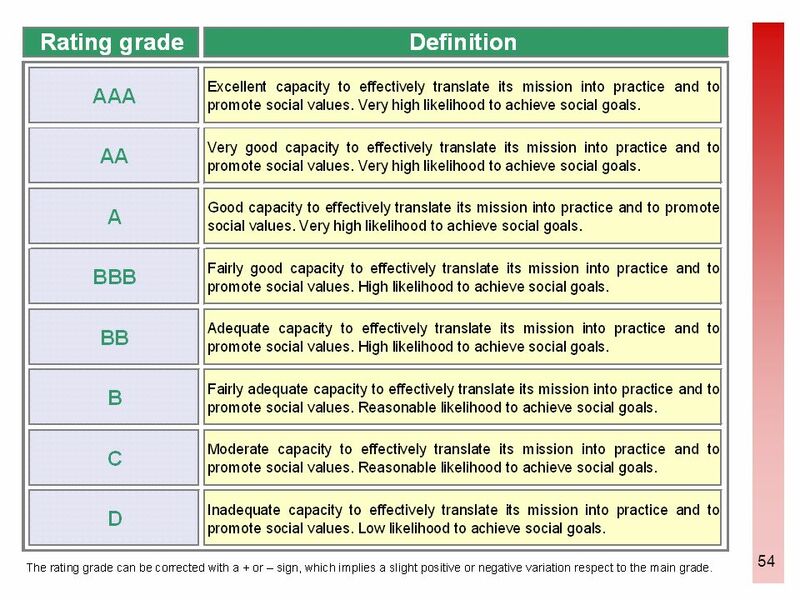 32 32 Basis for the analysis of a SPM system: Social Mission Statement (clarity and diffusion) The existence of an unique official mission statement is strongly recommended to ensure mission implementation and diffusion Mission has to be clear Social mission has to be an explicit expression of the main social goals. 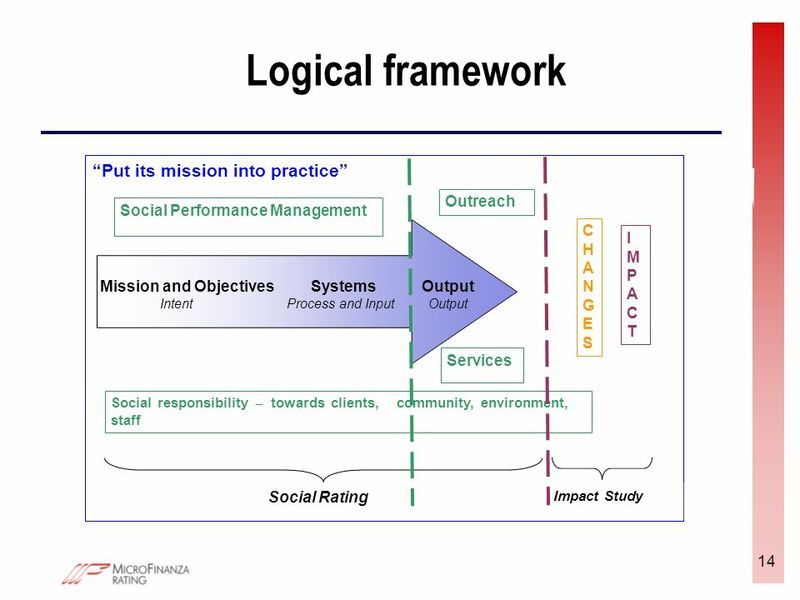 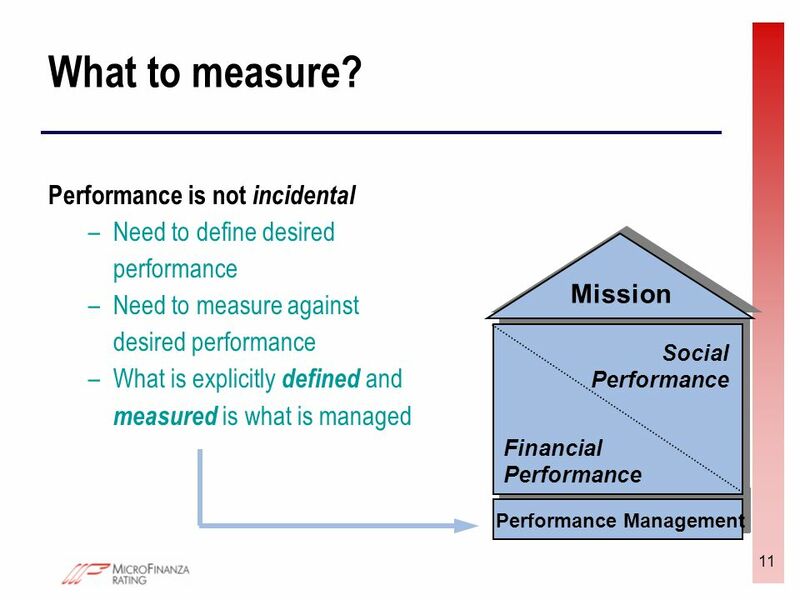 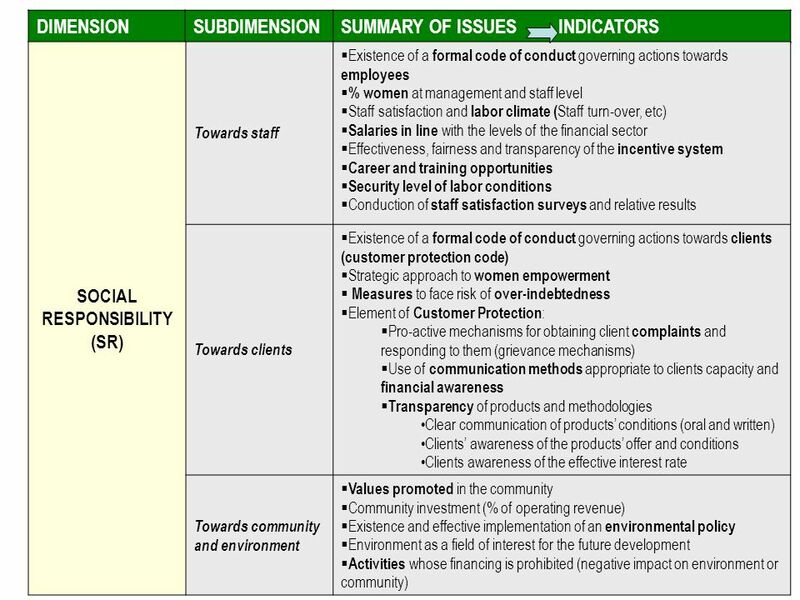 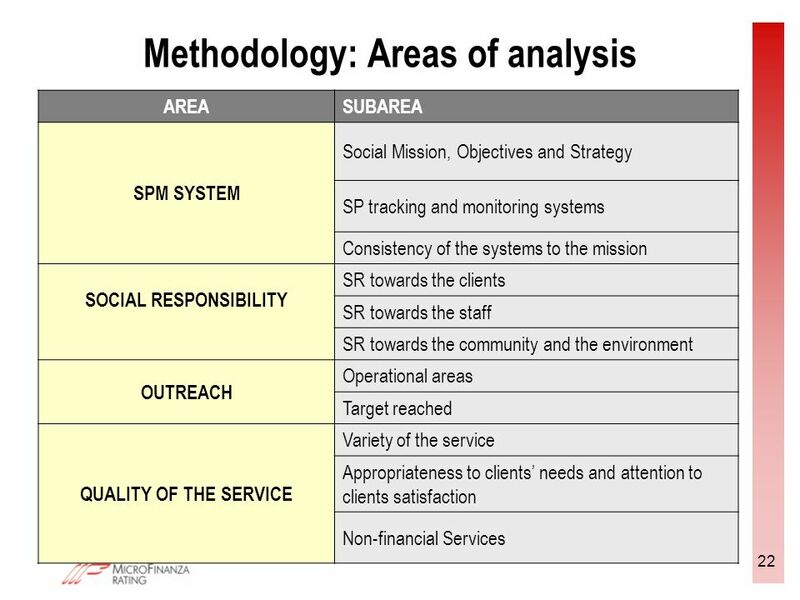 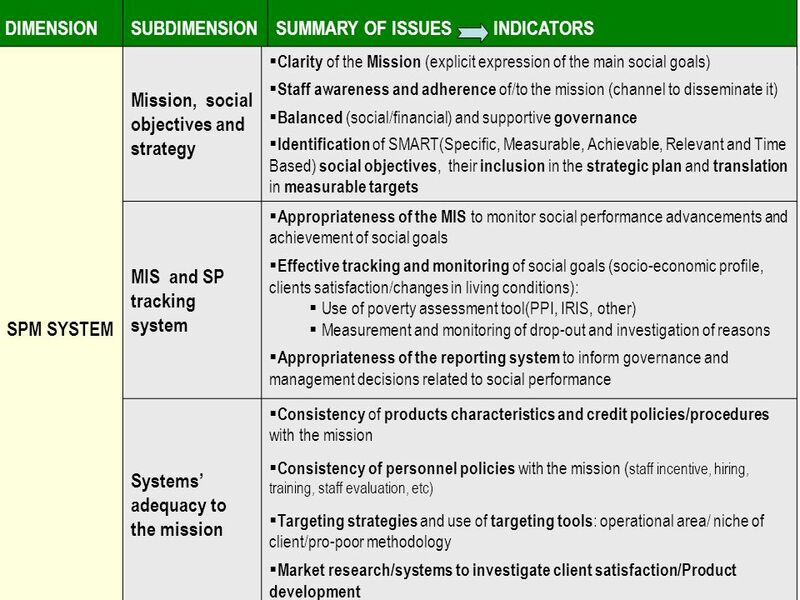 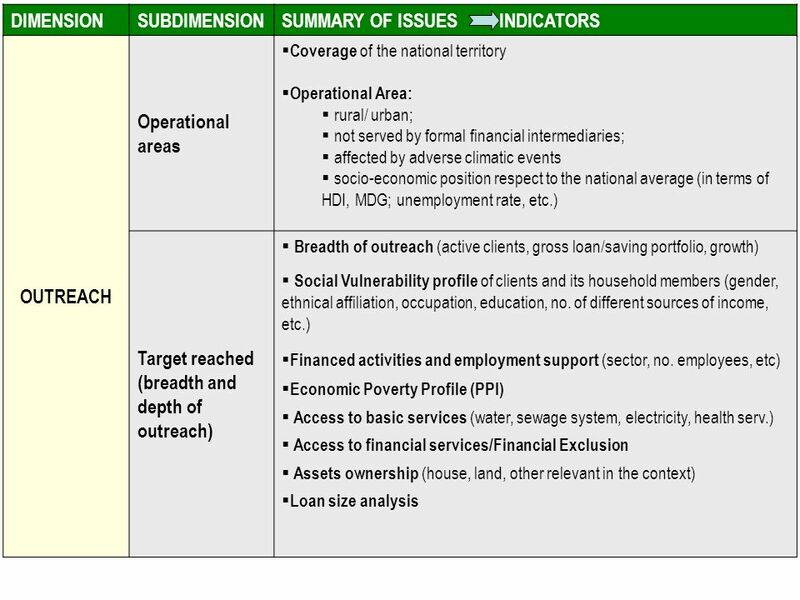 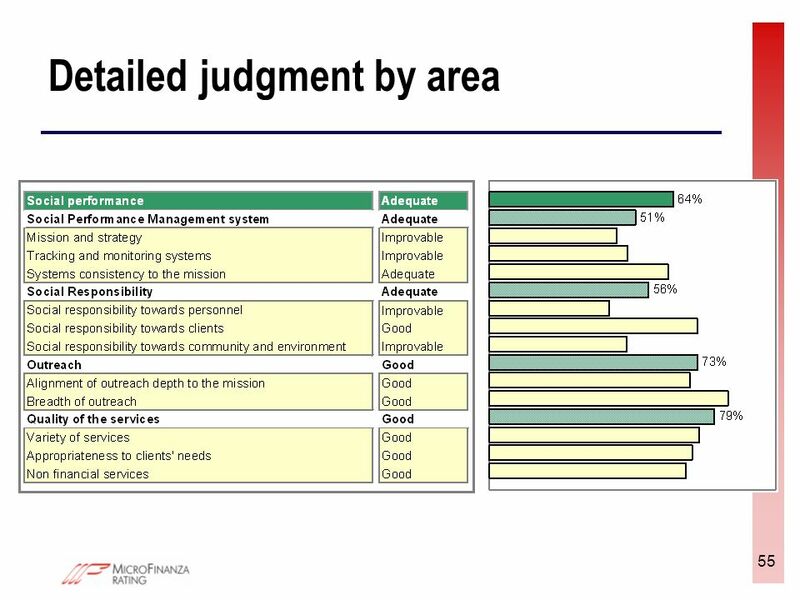 It should clearly indicate the desired performance: SG1: Who : outreach (priority target to be reached) SG2: How : service offered SG3: Why : desired impact/purpose Has to reflect the actual prioritized target Social Mission should be communicated clearly and consistently reinforced down the hierarchical ladder MFIs with an explicit and clear mission statement will tend to be more effective in fulfilling their social mission. 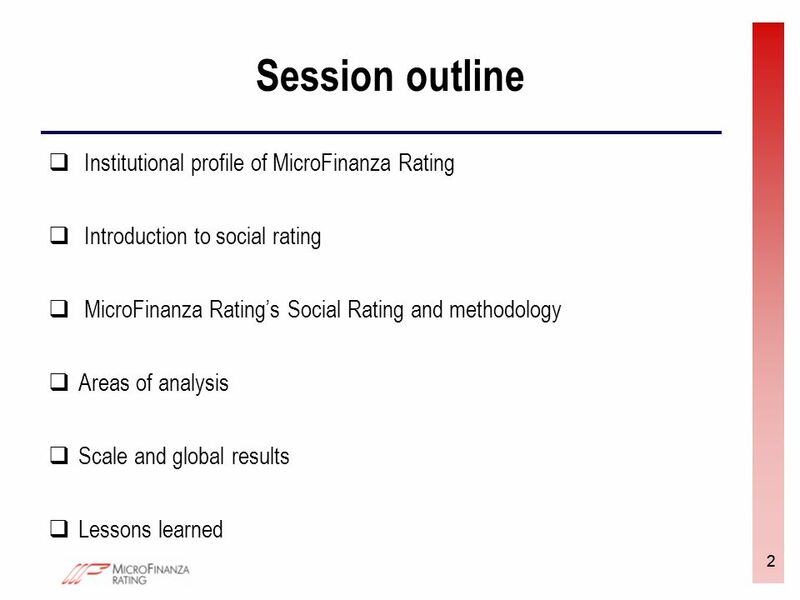 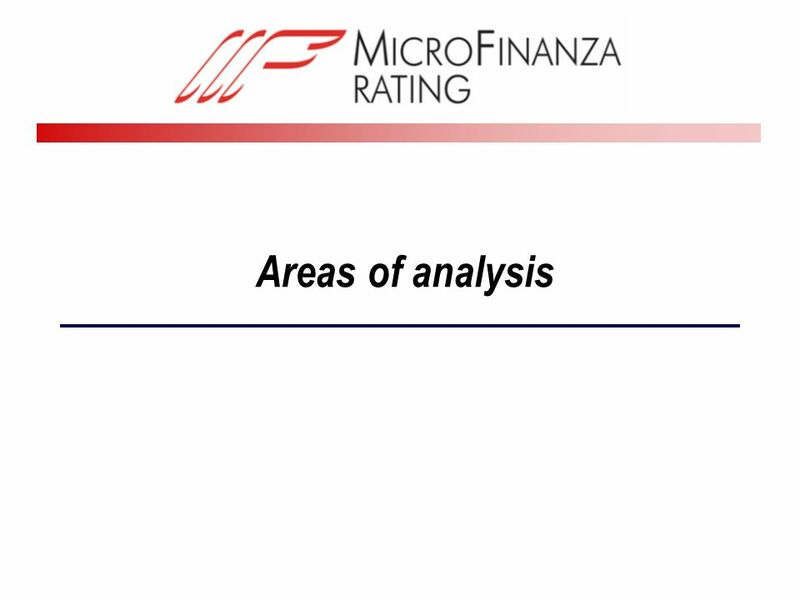 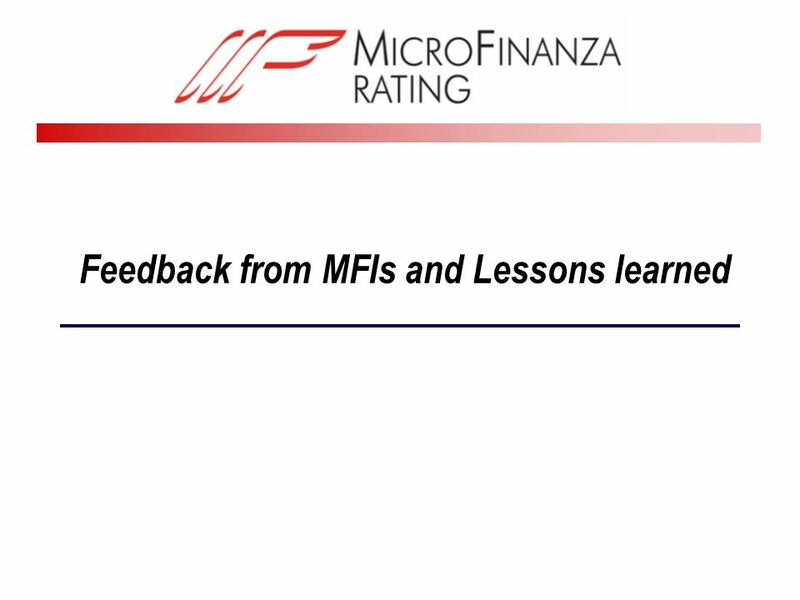 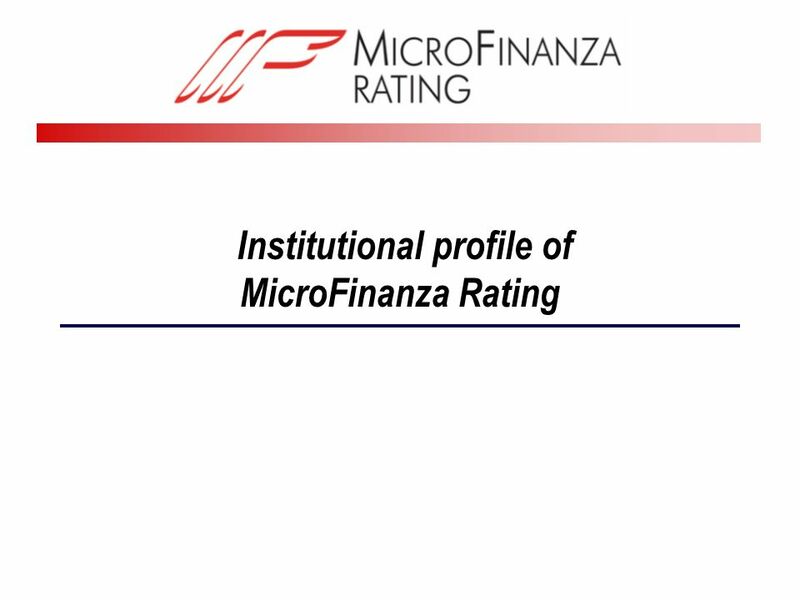 Download ppt "Rating and social performance assessment of MFIs 4th Azerbaijan Micro-finance Conference Baku – 16, 17 September 2008 Aldo Moauro – MicroFinanza Rating." 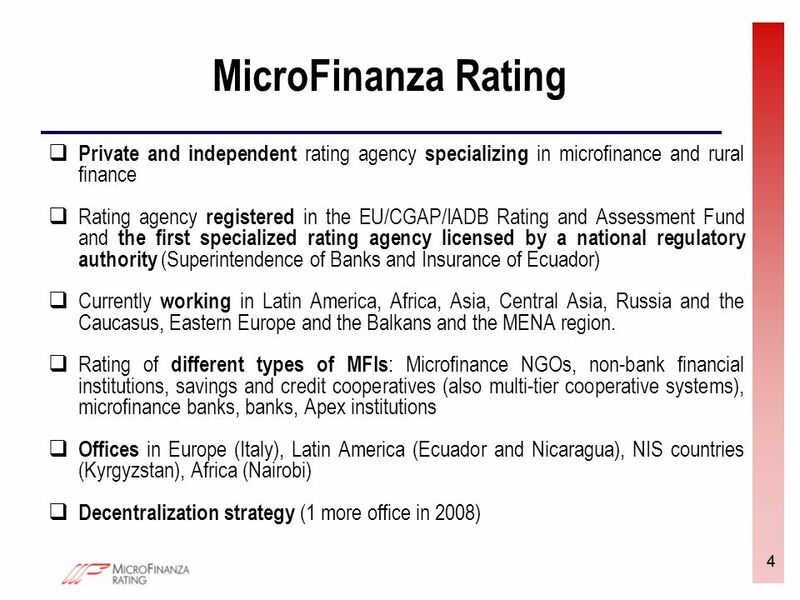 Open Days 2007 Micro-credits for Regional and Local Development Brussels, 10 October 2007. 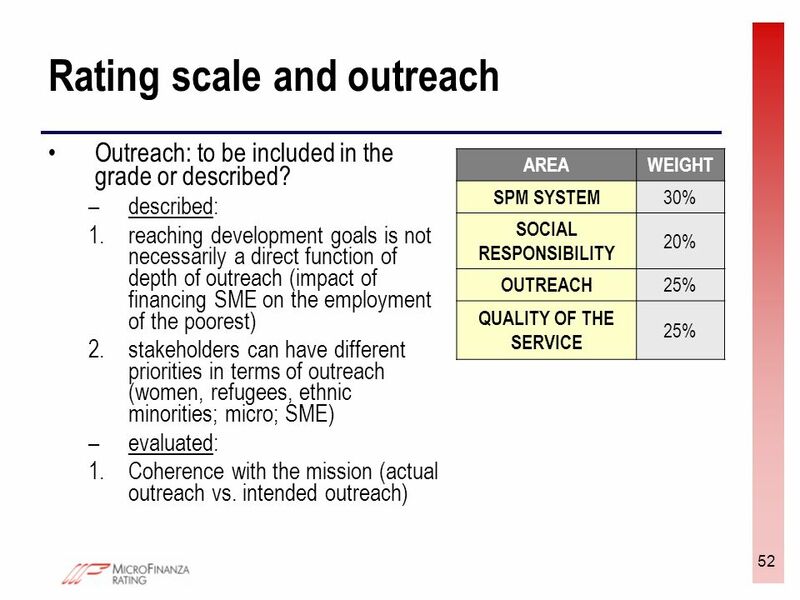 Setting the scene: Improving project implementation in a changing environment 2005 Project Implementation Workshop, Bamako Improving project implementation. 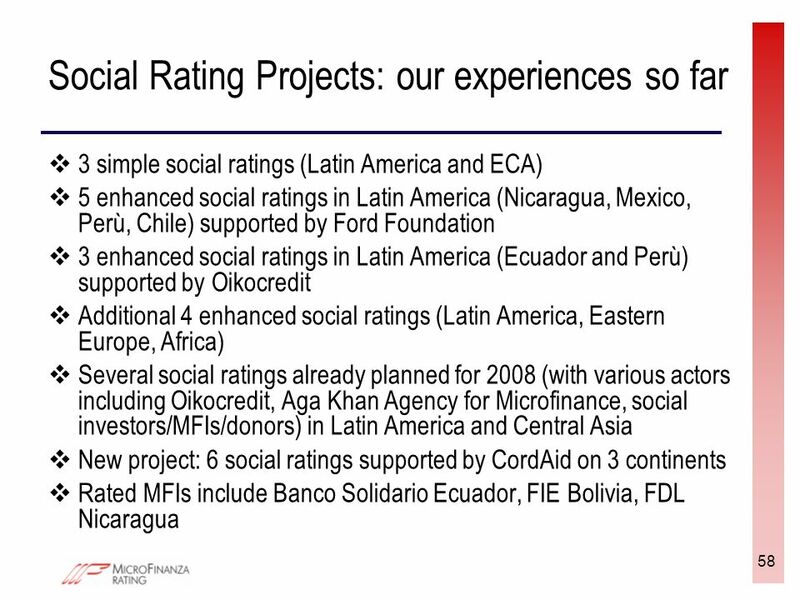 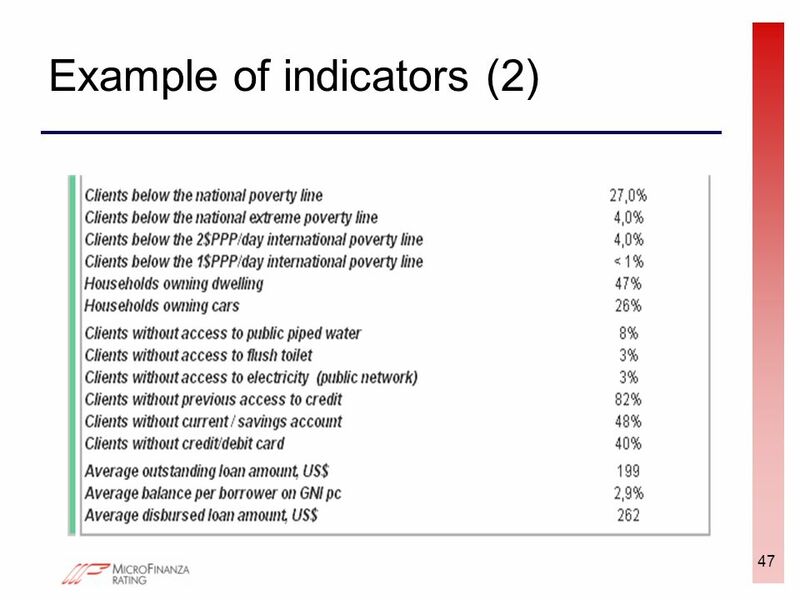 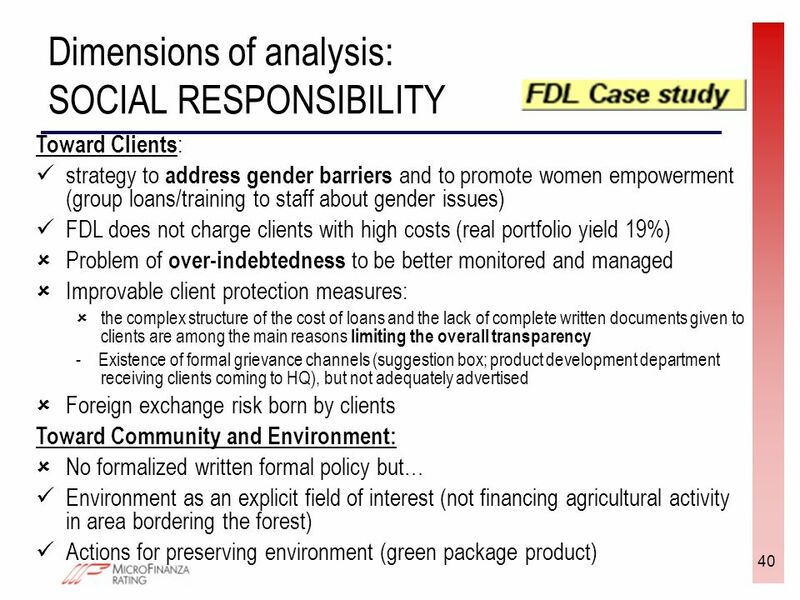 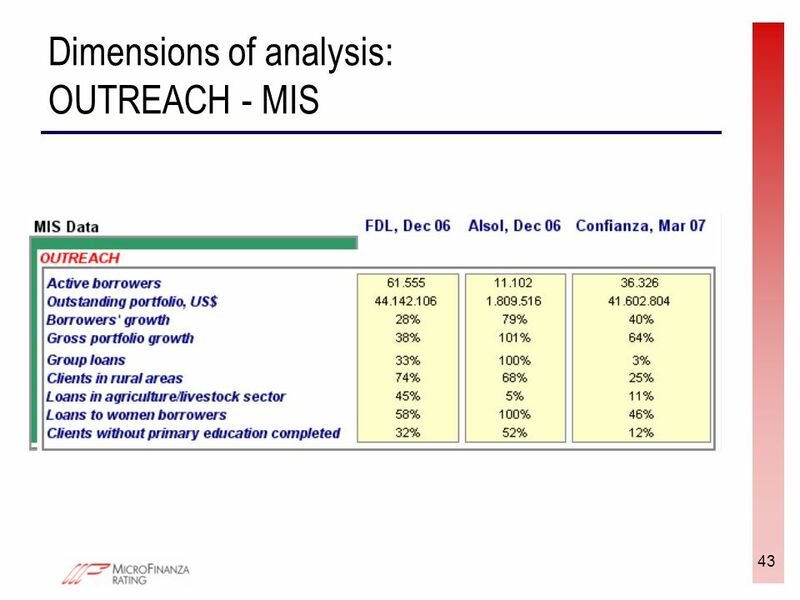 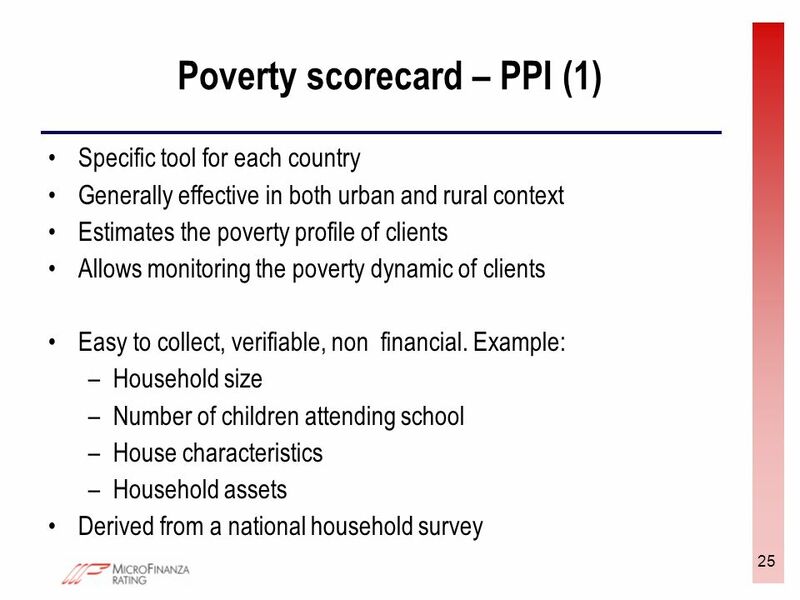 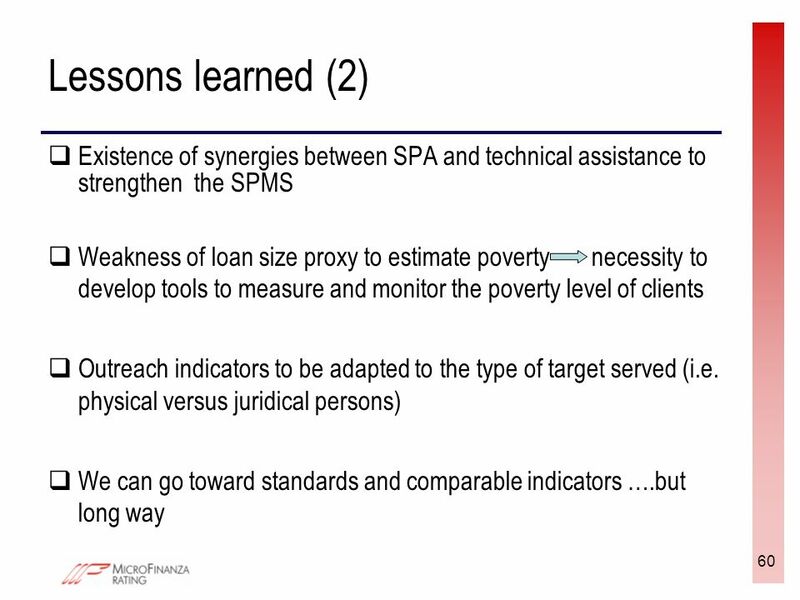 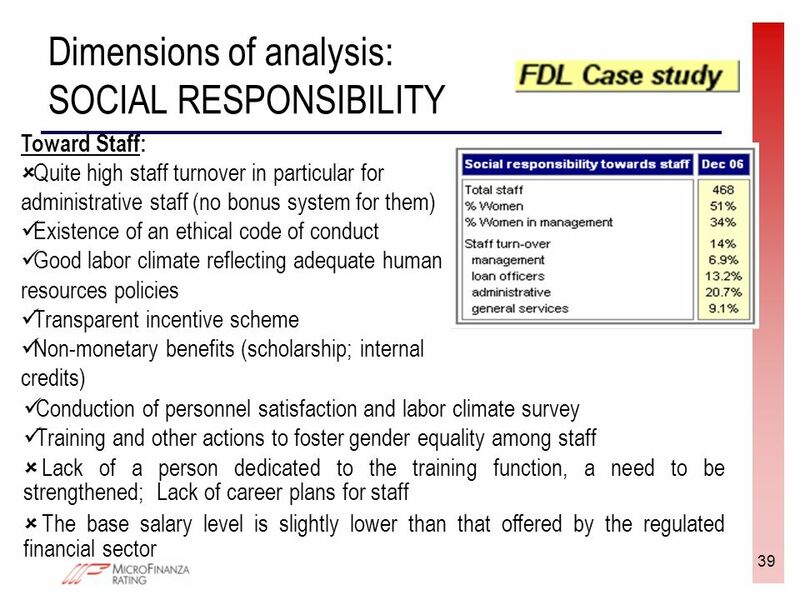 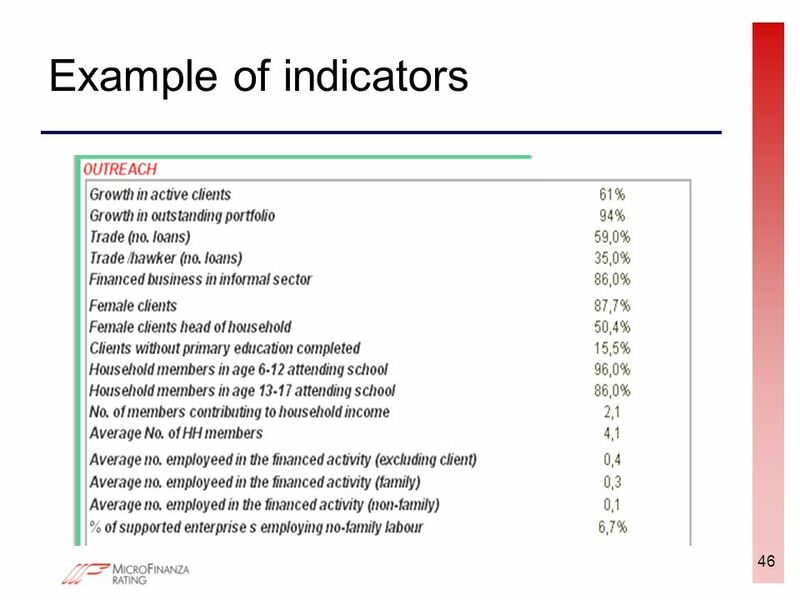 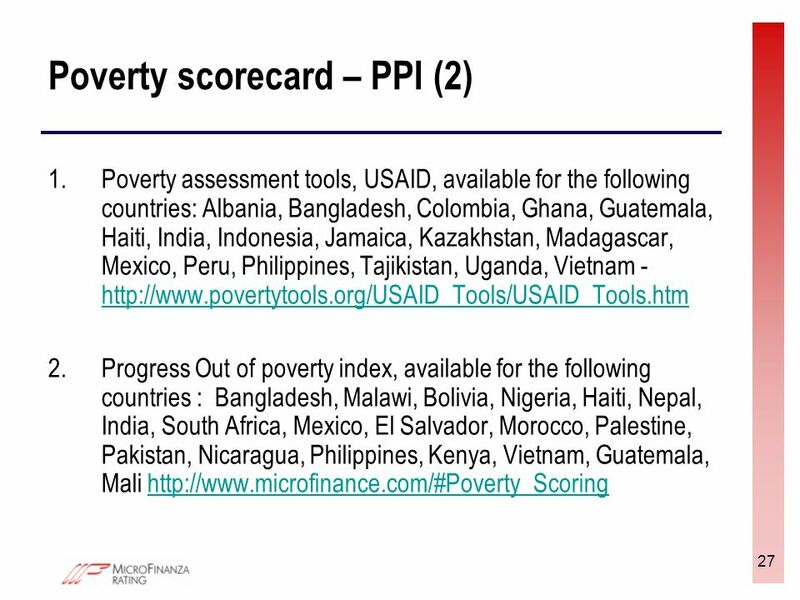 1 Independent Evaluation in IFC Presentation to Staff of Islamic Development Bank May 3, 2009 Marvin Taylor-Dormond. 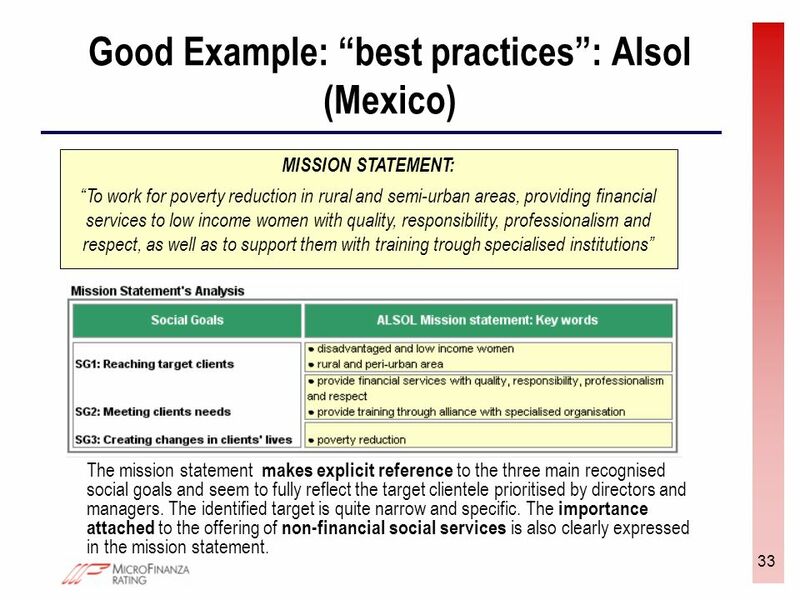 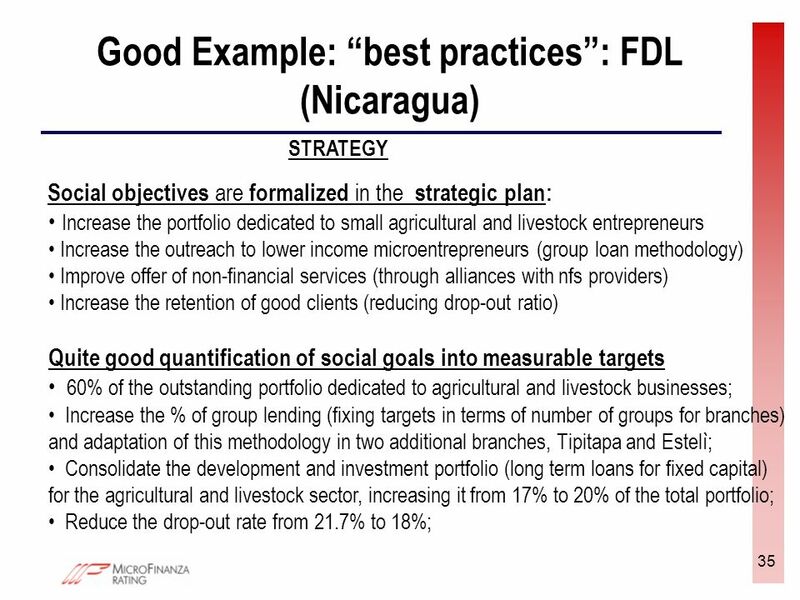 Session 1: Define and Monitor Social Goals With Leah Wardle of the SPTF, Daniella Hawkins of MicroLoan Foundation, Malawi.